That’s a Jon Foreman song (a great song by the way). It’s a song about asking someone not to leave. The problem is that the person doing the asking (whether this is autobiographical of Jon or not I don’t know) realizes that he’s part, if not the main part, of the problem and realizing that is hard. (At least that’s my view of the song). So in a way the thesis of the song if you will is, holding up a mirror to our own life is much more challenging and uncomfortable than looking at/judging someone else. Sounds a lot like Jesus’ lesson to look at the log in your own eye before talking about the speck in your sister or brother’s eye. All that being said it brings me to the idea of examining how we view ourselves. When we hold up a mirror to our life what do we see? What is your worldview of you? How we see ourselves is a huge part of our worldview- it greatly impacts our specific standpoint. Do we see ourselves as beautiful, ugly, adventurous, shy, intrinsically good or intrinsically bad, do we see ourselves through the eyes of the media, the eyes of our parents, the eyes of our peers? Now, someone might say we’re talking about self-confidence, or self-image. And that’s partially true, as long as we understand that those are actually different things, and what sometimes looks like self-confidence actually isn’t that at all. Self-confidence is, well just that, it’s the confidence in your abilities and power, to accomplish something or just take on life. Self-image is how you think about yourself or view your ability to do something. There is a slight, but monumental difference there. Firstly self-confidence assumes something positive, and self-image doesn’t assume positive or negative, it could be either, but let’s dig further. For example, can you ”show” self-confidence? I’d say yes, there are certain outward characteristics that we would see in someone that would show us that they have self confidence. To keep this from being far too long let me say this. You can have a positive self-image, but not necessarily be confident in a certain area. Also, true self-confidence (meaning not just something someone puts on to look good), understands our areas of weakness. It has a realistic expectation for our abilities and powers. Self confidence is looking at yourself and saying “I’m cool with me.” That doesn’t mean you don’t want to improve or change- some of the most self confident people are always trying to get better, (harder, better, faster, stronger). The thing about positive self-image is that it’s a view of yourself that accepts you where you’re at with all your gifts and faults. And you know what that means? It means you can accept others where they are at. You see when we talk about how we view ourselves we will eventually come around to the notion that our view of ourselves is also related to our view of others. To summarize, the view we have of ourselves encompasses both our self-image and confidence. How do we think about ourselves, and then how well do recognize our ability and power to act in a certain situation. So the question remains how should we view ourselves. If having self confidence is good, how do we have it in a healthy way, and how do we have a healthy self-image? Interesting that you ask such a question in the context of a Sunday Teens class, (oh what, I asked the question? well I’m still going to answer it) because the Bible has a lot to say about how God views us, and that may just impact how we view ourselves. I like starting at the beginning, it always seems like a good place to start. Genesis 1 tells of God creating humans. Okay, a couple very important things to observe here. God creates humans in his image. The Hebrew word is tselem. It comes from a root which means to shade, a phantom, a resemblance, or an illusion. The majority of the other times it’s used it is in reference to the images of the Baals or other gods, or as a resemblance of something the Israelites are to remember as in 1 Samuel 6. So what does that mean? One way of seeing Genesis one is God creating his temple, his temple which is the whole earth. And what do all the other temples have? An image of the god the temple is for. So what does God do? He places his image into the temple- humans. That means when we think of ourselves, through God’s eyes we first see HIS image, we are the representation of God in his temple. God also creates humans in his likeness. This carries on the theme of image. The Hebrew word for likeness is dĕmuwth. This word is often used when describing how something looks like something else, or has a particular pattern like something, or has the figure, characteristic or resemblance of something. So God makes us in his dĕmuwth. With his character, with his likeness. And what have we just learned about God in the verses preceding? That he is creative, that he is life-giving, and that he does good things. Interesting side note: The description of King David in 1 Samuel 16, says he was “ruddy” the root of the Hebrew word is also the verb adam. God makes humans. The Hebrew is adam, which the proper name Adam comes from. The word adam is connected to the word adamah which means ground, and both of these words come from the verb adam which means red, or ruddy (like the earth, or good soil would be). In English we don’t quite catch it, but the equivalent is that God made the earthling from the earth, or the groundling from the ground. This means that in creating humans God created something that was intrinsically connected to the rest of the creation. This was his image in his creation (or temple) and it was deeply connected to that creation. And as we’ll see in a couple of words that’s a big thing. What’s important to see is that the image bearing quality, and ruler quality (which we’re about to get to) are both part of male and female. Also, it means that God’s character is also encompassed in both male and female. It’s interesting to think of the differences of male and female experience and expression. I seems evident to me that God’s character, his entity, is so vast and complex that it couldn’t fit into just one type of human. He had to create variety to encompass his expansive nature, hence the wonderful diversity in humans. God created humans to rule over the creation. The Hebrew for rule is radah. The next time this world is used in the Bible is in Leviticus. In this context it’s used about someone who has a servant (technically slave) and how they should not rule over them harshly, but revere the Lord. This opens us up to the idea of ruling as a Hebrew concept. In Deuteronomy there are guidelines listed for the King. The King is to be someone God chooses, instructed to not take many things for himself, he is meant to revere the Lord his God, and not consider himself better than his brothers (those he is ruling). So what does this have to do with humans being rulers? Simply put, the act of ruling is not meant to give us superiority over the rest of creation in order for us to do whatever we want with it, but in order to partner with God in caring for creation. We are deeply connected to this creation and are meant to be stewards not slave masters. God making us as rulers sets us in a place of honour, in a place of his likeness, and also in a place of trust. God trusts us to take care of what he’s made. That’s a big position. God’s putting faith in us. So we are God’s image in his temple, his representatives with his character, we are connected to his creation, partnering –both male and female- in the rule of what God has given us. Jesus embodies this view of people throughout his whole ministry, which really shouldn’t surprise us. Not only is Jesus a Jew who would have had this understanding of humanity engrained in his psyche, but he also fully embodies God’s character. In a sense Jesus is the ultimate image bearer, and in that sense Jesus is the most human, and in that sense becoming like Jesus is actually about becoming more who we were meant to be, but maybe I’m getting a head of myself. Let’s look at two examples of how Jesus embodies the view of humanity painted in Genesis One. 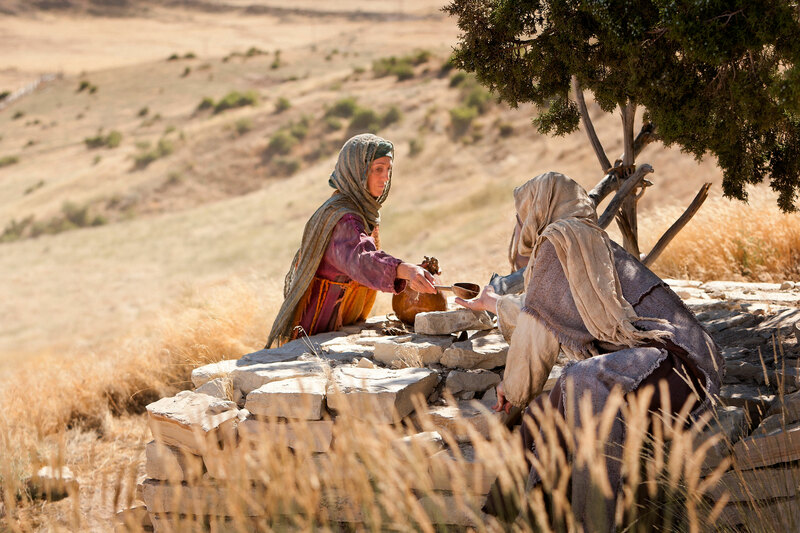 There is an amazing story in the Gospel of John where Jesus interacts with a Samaritan woman. To grasp the beauty of this story we need to understand the relationship between Jews and Samaritans in Jesus’ culture. The Jews and Samaritans shared common heritage. They were both descendants of the 12 tribes of Israel. The Samaritans claimed to be the true believers made up of those who remained in the land during the Babylonian exile. They said that the Jews brought back a religion that was altered by their time in Babylon. The Jews claimed that Samaritans had married pagan religion with the worship of YHWH. They saw the Samaritan worship as a betrayal of covenantal faithfulness and couldn’t believe that their temple in Jerusalem had been left in ruins. Both of these groups forbid their people to have contact with each other. The Jews were not even supposed to pass through Samaria and would make a excessive detours to make sure they didn’t come into contact with Samaritans. So this story becomes even more powerful with that understanding. Jesus sees the connected nature of humanity, that though his people and this woman’s people have been feuding for hundreds of years, they are both God’s people. 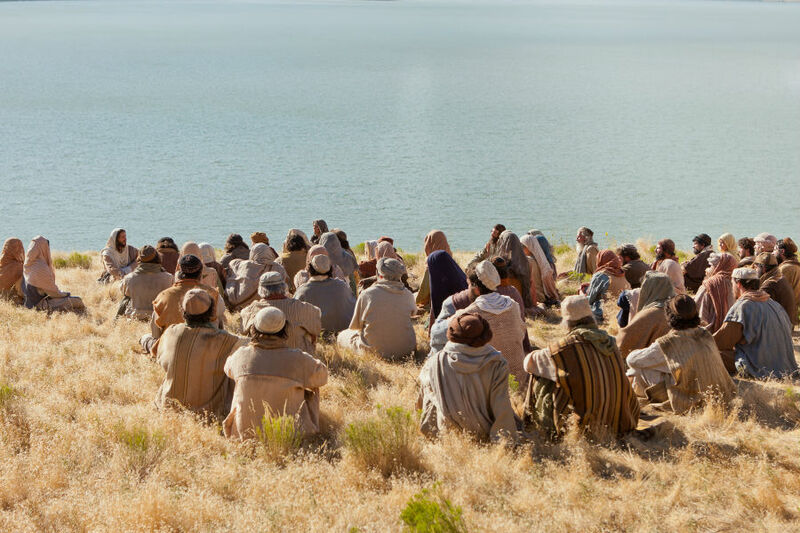 The story flows from a Samaritan woman sitting with a Jewish Rabbi, to her declaring that he is a prophet, to understanding that he is the messiah, to professing to all of Samaria that he is the saviour of the world. At the foundation of this interaction is the amazing truth that we are all God’s image bearers, that we share in his character and that we can join in the good work that he is doing in the world. That’s what happens with the Samaritan women. Jesus breaks down the negative view of herself her culture has given her, he shows her the nature and character of God, which she intrinsically responds to, and she shares the message that God is bringing to life through Jesus. This is wonderfully characteristic of Jesus’ ministry. The teachings Jesus gives in the sermon on the mount (and on the plain) are immersed in these ideas. Jesus continually draws his listeners into the idea that they are meant to show God’s likeness. He says you are the salt, you are the light – we are meant to be God’s ambassadors in this world. He shows us what it means to embody God’s character- be reconciled to your brother and sister, love your enemy, have eyes of love not lust, be true to your word, do not seek retaliation, give to the needy joyfully not for personal honour. Jesus takes the cultural norms of his society and flips them around. Jesus’ culture, and in its own way ours as well, was built around honour systems. Systems that were all about saving face with your peers, staying above those under you, and earning favour and honour from those above you. Jesus says you don’t need to view yourself and then act based on those systems. You view yourself based on a worldview that says, Look at the birds of the air; they do not sow or reap or store away in barns, and yet your heavenly father feeds them. Are you not much more valuable than they? Jesus says don’t view yourself based on the parameters of culture, or the world. You are to view yourself based on the truth that you are created in God’s image, so live out his character, of compassion and love. Your fellow humans, your brothers and sister, are created in that image too, so treat them as such. And you are all blessed with God’s image for a purpose, to care for each other and the world around you. To join in the good, creative, life-giving purposes of God. That’s a pretty powerful view of ourselves. How often have we held up the mirror to our lives and seen that? I think this is a huge self-image booster. Does that mean we won’t have days where we’re down on ourselves? No. Does this mean if we follow Jesus we’ll always be free of depression and mental illness? Sadly not necessarily. But it does mean we have a beautiful and solid foundation to build our self-image on, and that will help build our self-confidence and it will help us want to be and become better versions of ourselves. That is a view of ourselves that will shape us into the creative, loving, blessing, life-giving people God wants us to be. A people who embody God’s image and his character, embrace our uniqueness and diversity, and work together to make this world flourish. And as we saw above, becoming that type of person, is emulating Jesus, and thus becoming truly human.